From time to time, the webpack core team loves to get the community involved on Twitter, and share bits and pieces of knowledge in a fun and informative way. This time, the “rules to the game” were simple. 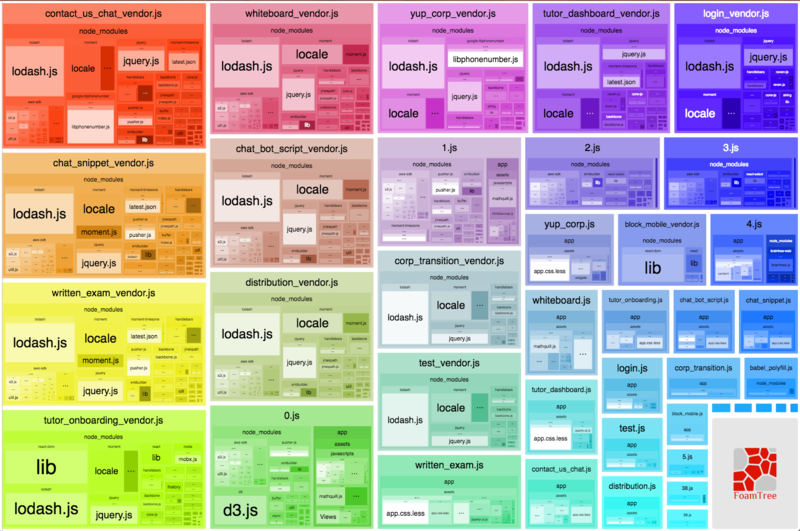 Install webpack-bundle-analyzer, generate a fancy colorful image of all of your bundles, and share it with me. In return, the webpack team offered to help identify any potential issues we could spot! The most common theme was code duplication: Libraries, components, code was duplicated across multiple [sync or async] bundles! This is a specimen example. Thank you Swizec for letting me share it. We can infer quite a few things from this (without looking at the actual configuration). The activeApps variable most likely represents each of the individual entry points. Below are a few areas that I circled that could use some improvement. 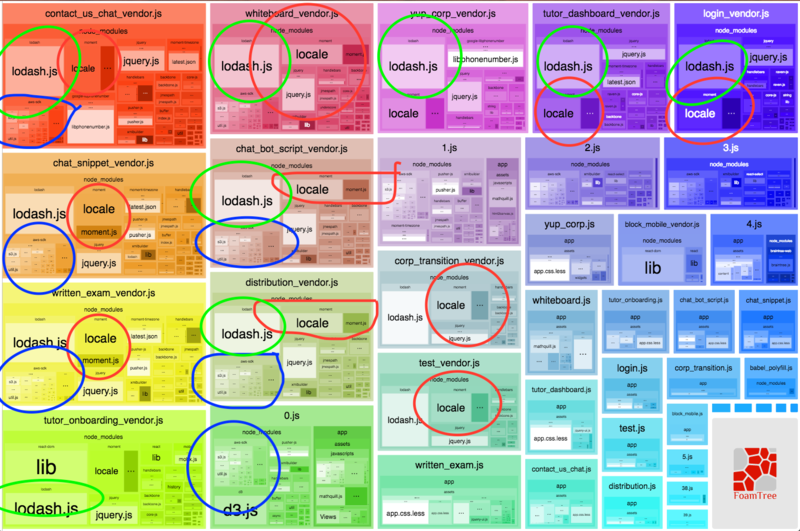 What we see above is many large libraries like momentjs, lodash, and jquery being used across 6 or more vendor bundles. The strategy for adding all vendors into a separate bundle is good, but we should also apply that same strategy across all vendor bundles. Hey webpack, look across all chunks (including the vendor ones that were generated) and move any modules that occur in at least 6 chunks to a separate file. In this case it looks like the file was named “manifest.js”? As you can see now, all of those modules were extracted into a separate file, and on top of that, Swizec reported that this decreased overall application sizes by 17%! So this amount of duplication wasn’t as severe in terms of overall code size, however, when you look at the full size image below, you can see the exact same 3 modules across every async chunk. 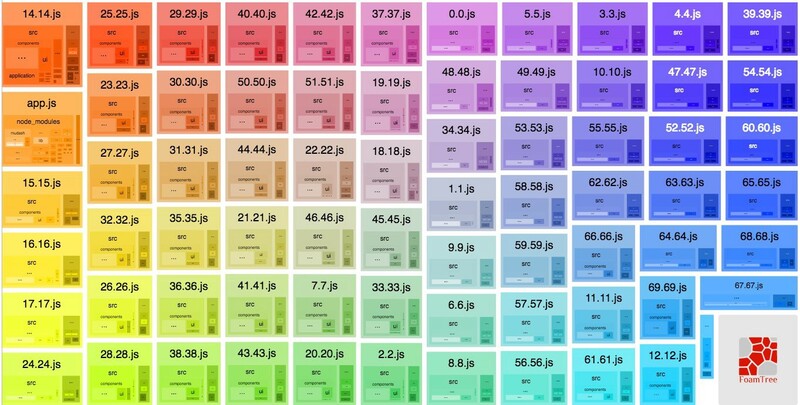 As you can see above, the same 2–3 components are used across all 40–50 async bundles. So how do we solve this with CommonsChunkPlugin? Hey webpack, look through all normal [aka lazy loaded] chunks, and if you find the same module that appears across 3 or more chunks, then separate it out into a separate async commons chunk. There is likely room to even play with a larger minChunks value here to result in a smaller commonlazy.js bundle. Now the async chunks are extremely tiny, and all of that code has been aggregated into one file called commonlazy.js . Since these bundle were already pretty tiny, the size impact wasn’t very noticeable until second visit. Now there is far less data being shipped per code split bundle and we are saving users load time and data consumption by placing those common modules into a separate cacheable chunk. Yo webpack, when you come across a module whos absolute path matches lodash or momentjs, and occurs across 3 separate entries/chunks, then extract those modules into a separate bundle. You could apply this same behavior to async bundles by setting `async: true` also! EDIT (April 1st): I stated that you could use filename with minChunks, but we prevent this now as of webpack 2.3.2+. CommonsChunkPlugin() may be powerful, but keep in mind that each one of these examples is tailored to the application it is applied to. So before you copy-pasta these snippets in, take advice from Sam Saccone and Paul Irish and MPDIA first to make sure you apply the right solution. Always understand your process before applying solutions! These are just a sampling of options and uses for CommonsChunkPlugin(). To find more, check out our /examples directory in our webpack/webpack core GitHub repo! If you have a great idea for more, feel free and submit a Pull Request!